With just one day to go until the release of The Broken Divide, I figured I should probably take a second to write about the actual release of the album itself and how it came together after I finished writing it (which you can read about in more detail in my previous TBD-related blog posts). Before I talk about the release of The Broken Divide, I’d like to talk a little bit about the release of Pieces. Pieces was the first album/compilation thing that I had released independently in about four years or so, and so I decided to try something a little different with the release. There are two great advantages to releasing music independently, as far as I’m concerned – the first is that it afford you complete creative control over what you put out. Pieces was something I’d been toying with for a while, and I knew I wasn’t in a rush to release it. This gave me plenty of time to sort out mastering, album artwork, and release formats. I’ve already talked at length about my approach to pricing (or lack of) and the “audiophile master” release of Pieces – both of which you can read about here and here. I mention this because it’s an approach I’m taking once again with the release of The Broken Divide. Which brings me onto the second big thing I love about releasing music independently – the freedom to experiment with release methods. One thing I have been experimenting with recently is the Bandcamp subscription format. I still believe in making my major independent releases easily accessible to everyone, but the subscription system affords me the means to get bonus goodies across to people who might be more interested in checking this stuff out without necessarily “cluttering” my discography for those who just want to listen to my albums. It’s an interesting balancing act, but after releasing Pieces I had more or less decided quite early on that my next album release was going to be another pay-what-you-want release on Bandcamp. Sorry guys, you’re on your own. Alas, another similarity between these two releases is that there is no physical CD version. Back when I was releasing my first or second albums, this idea would have been kind of abhorrent to me – I love picking up CDs where I can, but the sad truth is that demand for physical copies of my music is nowhere near substantial enough at this point to warrant getting a decent run made and, as with many other people out there, I have no problem with my own musical purchases being digital… provided I can download it in the format of my choice. Maybe one day I’ll consider a limited run of CD copies for some of my more recent releases, but for the time being it’s not going to happen. That said, digital downloads of my music have skyrocketed in the past few years so, hey, there you go! On a similar note, I have still in no way whatsoever been bitten by the vinyl bug. It’s a growing format but it’s one that I just don’t get – for me, it’s kind of a weird situation. There are many releases for which the “best” version is the vinyl release, simply because the most tastefully mastered version of an album is usually the vinyl version. Nothing to do with the format (outside of some physical constraints due entirely to the medium itself which go some way to preventing bad mastering practices), but because people who listen on vinyl tend to be more picky about this kind of thing. Which is great! But there is nothing stopping people from releasing tasteful masters of their albums digitally, and I find the lack of options kind of strange in that regard. Maybe in a few years I’ll be all over vinyl, but for the time being… not happening. It’s not something I’m interested in and it would be both disingenuous and financially bonkers for me to go down that route. This is all kind of interesting to me because this will be my first “big” solo release since 2013 – I’m super happy with all of my interim releases (Pieces, AdFi, Obscurer), but this is the album that I would consider the “true” follow-up to Icarus. That album had a bit of a troubled release, to be honest. From issues with the artwork, digital outlets still not stocking it correctly (go ahead, try and find it on Amazon UK), payments and recoupable costs having to be chased up for about a year, and a general lack of post-release support… yeah, it was not pretty. Hell, for a few months I had no idea which label it was going to be released through thanks to a total communication snafu. Alas – due to the nature of it not being an independent release, this is all stuff that was generally outside of my control. Icarus really made me appreciate how much I’d taken full creative control for granted over the years, and how it’s something I’m not willing to relinquish for my own solo releases. The release of Pieces made me really, really appreciate how much I’d missed releasing music independently… the general feeling I got during both releases was completely different. I’d like to emphasise that this in no way somehow reflects my own personal feelings of both albums from a musical point of view – this is strictly from a release/logistical perspective. ANYWAY. Bitching and moaning aside(!) – the point I’m trying to make is that returning to that mindset of retaining full control during the writing, production, and release process for a “big” solo release was a really wonderful feeling, and I think that feeling of releasing something completely on my own terms because I wanted to is something that runs throughout the entire album. 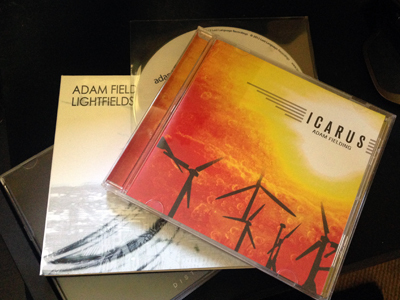 In many ways the huge contrast between the release of Icarus and Pieces fuelled the direction I took with this album… knowing that it was probably going to be an independent release made me think “hey, that means I can pretty much do whatever I want!” which is, y’know, exactly what I did. So. One more day to go. I hope you get some time to check out the album in its entirety once I release it into the wild, and I hope you like what you hear. Cheers!